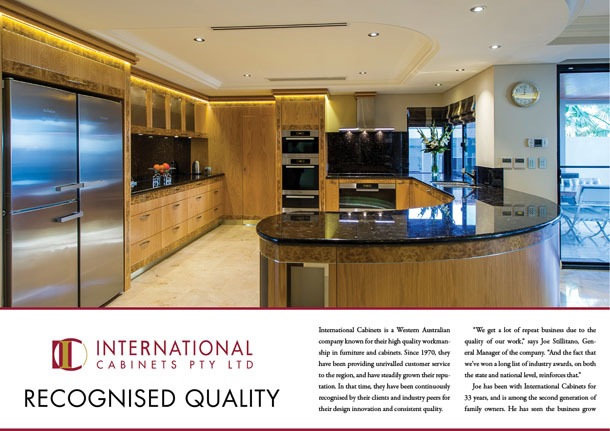 International Cabinets is a Western Australian company known for their high quality workmanship in furniture and cabinets. Since 1970, they have been providing unrivalled customer service to the region, and have steadily grown their reputation. In that time, they have been continuously recognised by their clients and industry peers for their design innovation and consistent quality. Joe has been with International Cabinets for 33 years, and is among the second generation of family owners. 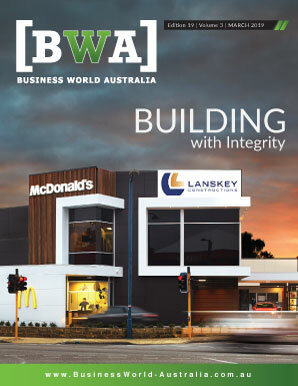 He has seen the business grow significantly, and was there when they moved to their current premises in Balcatta – premises which includes a showroom, design and selection area, and manufacturing facility all under one roof. Today, International Cabinets’ customers include a range of builders in metropolitan Perth. They service everything from the project home market up through to the high-end boutique market. They also have some private clientele they attract through their showroom, or who have worked with them in the past. No matter who the client is, however, International Cabinets has the ability to supply a “complete service” to their clients. Their qualified staff can individually design the client’s cabinets and furniture, specific the very best quality materials, and have it manufactured to exacting standards at their nearby premises. According to Joe, that range of abilities sets the company apart. The company has also heavily invested in computerised programmes and machinery, which has created better efficiency in the processing of product through the chain of manufacture. According to Joe, those efficiencies have allowed the business to remain competitive in a tight market. 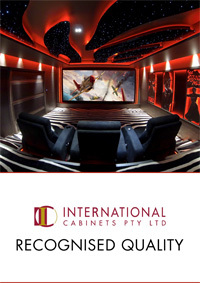 Over the years, International Cabinet’s quality and innovation has been recognised practically non-stop by industry bodies such as the FIAA, the HIA, and the Australian Furniture Awards. Since 1995, they have won two or more awards every year. In 2012, the company’s list of accolades was particularly lengthy. From the FIAA, they took home three wins for Built-in Residential Furniture Bathrooms & Laundries, Furniture using Exotic Timbers, and Built-in Furniture using reconstituted Timber Veneers. At the HIA Awards, they won in even more categories, including New Kitchen project of the Year, New Bathroom Project of the Year, and New or Renovated Laundry project of the Year. At the Australian Furniture of the Year Awards, International Cabinets also took home a prize for Excellence in Furniture Using Veneered or Painted Timber Panels, which they won for their Fazzaris Dining Table Product. Joe credits the company’s consistently award-winning results to the strength of that team – which not only includes their direct staff, but also their roster of trusted subcontractors. Most of those people have been working with the company for five years or more, with some having been in the business even longer than Joe. Moving forward, Joe says that even though the company is facing new challenges every day, they are feeling very optimistic about the future. He sees customers are getting fed up with the low-cost, low-quality furniture and cabinets they have favoured in recent years. He sees that trend leaning back towards better quality, and customised processes.